Finding a shampoo -- natural or not -- without silicones and sulfates has proved to be quite a difficult task for me. 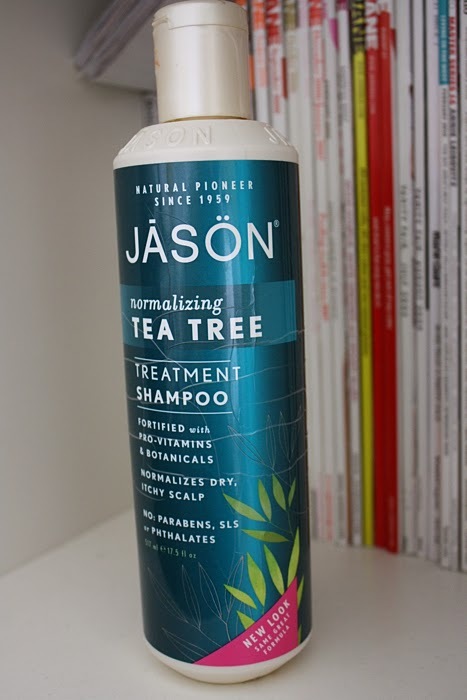 The JASON Normalizing Tea Tree Treatment Shampoo was my second ever "natural" haircare product, after I tried the Yes to Carrots Pampering Hair Conditioner (which I couldn't recommend more to anyone who has dry, thick hair). And like the Yes to Carrots conditioner, I have had fantastic results with the JASON shampoo. This normalizing shampoo gently cleanses and nourishes to minimize dry, flakey skin build-up on the scalp. Australian Tea Tree oil, known for its anti-bacterial and anti-fungicidal properties, is combined with Grapefruit Extract and protein to purify and fortify hair follicles while soothing Calendula, Hops, Sage Extracts and Wheat Germ Oil helps relieve discomfort of itchiness. Gentle enough to use everyday, hair is soft with added volume, luster and manageability. For those who do have dandruff or scalp irritation, the antibacterial and antifungal properties of tea tree oil are supposed to help put a stop to (or at least slow down) the bacteria that causes some of these issues, including itchiness. It seemed to be better at clarifying my scalp and roots (oil, product, flakes) than most other "clarifying" shampoos I've used, and all without drying my scalp and hair out! I wouldn't say that this shampoo gave me any more volume, but I have the kind of hair that needs something to take away some volume, so it wasn't missed. My hair was indeed much more manageable and shiny after using this shampoo, though it didn't feel weighed down at all. There were times when I used this every day for a string of days or weeks, and never did I feel that my hair reacted negatively to it like my hair has with so many other types of shampoos. As for those stereotypes with sulfate-free shampoos: hard to lather up, hair doesn't feel clean afterwards ... Yes, this was a very watery shampoo. It wasn't hard to get it into my hair, but there was considerably less lather, though that didn't make me feel as if I couldn't get my hair clean. And my hair did feel clean afterwards, but also not squeaky clean like it had been stripped of all of its oils and life. I suppose that's what the normalizing part of this shampoo is supposed to do. The only somewhat negative things I have to say about this shampoo are that ... the scent is not for everyone. It's tea tree oil-scented, and the scent lingers. It took a little bit of getting used to for me, but it wasn't a deal breaker. The other thing is that those with fine hair may not find this shampoo to their liking. I might be wrong about this, because maybe natural products are better at "adapting" to different types of hair and skin, but typically if a hair product works really well in my thick, dry hair, it's too much for someone with thin, fine hair. 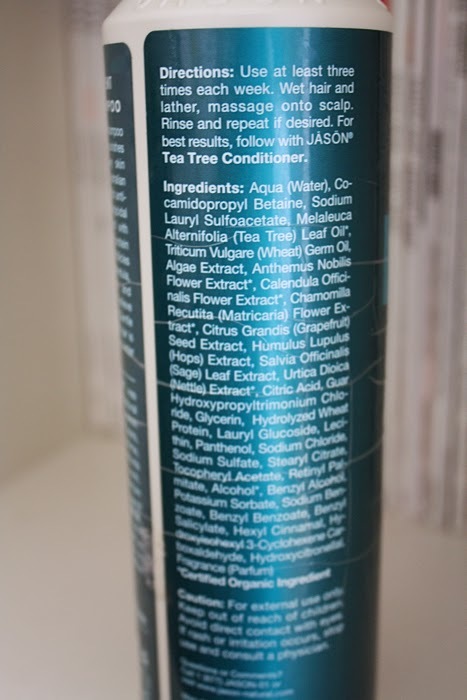 Lastly, though the JASON Normalizing Tea Tree Treatment Shampoo does not contain sulfates or silicones, it does contain sodium benzoate -- something I've found to be true of a lot of natural hair products. I suppose the addition of a potentially toxic chemical is a fair trade-off for getting rid of a bunch of others ... that's the way I'm beginning to see it, at least. Ingredients: Water, Cocamidopropyl Betaine, Sodium Lauryl Sulfoacetate, Tea Tree Leaf Oil, Wheat Germ Oil, Algae Extract, Anthemus Nobilis Flower Extract, Calendula Officinalis Flower Extract, Chamomilla Recutita Flower Extract, Grapefruit Seed Extract, Hops Extract, Sage Leaf Extract, Nettle Extract, Citric Acid, Guar Hydroxypropyltrimonium Chloride, Glycerin, Hydrolyzed Wheat Protein, Lauryl Glucoside, Lecithin, Panthenol, Sodium Chloride, Sodium Sulfate, Stearyl Citrate, Tocopheryl Acetate, Retinyl Palmitate, Alcohol, Benzyl Alcohol, Potassium Sorbate, Sodium Benzoate, Benzyl Benzoate, Benzyl Salicylate, Hexyl Cinnamal, Hydroxyleohexyl 3-Cyclhexane Carboxaldehyde, Hydroxycitronellal, Fragrance.